(Nanowerk News) Our need to store data is growing at an astonishing rate. An estimated 2.7 zettabytes (2.721) of data are currently held worldwide, equivalent to several trillion bytes for every one of the 7 billion people on Earth. Accessing this data quickly and reliably is essential for us to do useful things with it – the problem is, all our current methods of doing so are far too slow. There are other ways of moving magnetic data, however. My group at the University of Sheffield in conjunction with John Cunningham at the University of Leeds have been using simulations, now published in Applied Physics Letters ("A sound idea: Manipulating domain walls in magnetic nanowires using surface acoustic waves"), to explore ways of making racetrack memory more efficient and stumbled upon a surprising solution using sound waves. 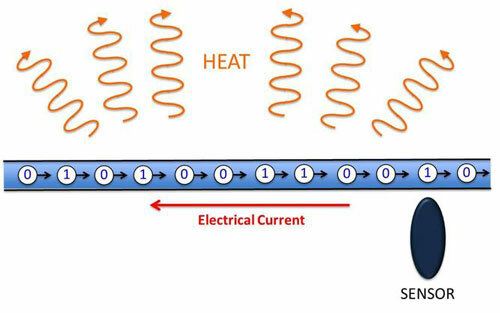 Using this method we created two sound waves, one flowing forwards along the nanowires and one flowing backwards. 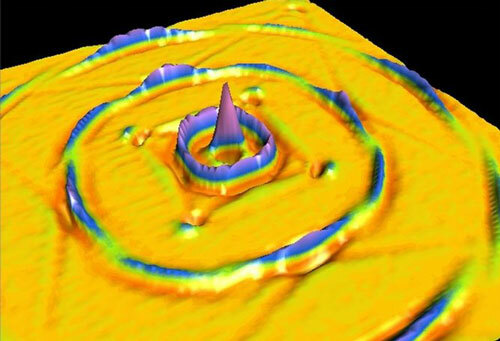 These waves combine together to create regularly spaced regions of the nanowire which vibrate strongly separated by regions that don’t vibrate at all. Our research shows link to this that the magnetic data bits are attracted to and held in place at the strongly vibrating sections. 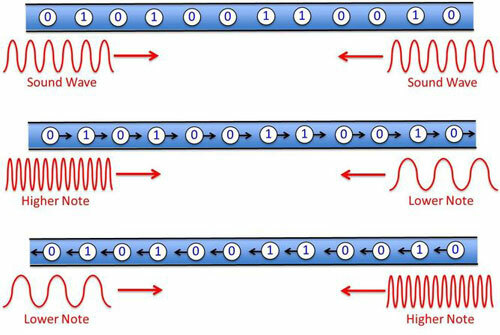 If we then change the pitch of two sound waves, so that one “sings” a higher note and one a lower note, we find that vibrating regions start to flow along the nanowire, pulling the data bits with them just as is required for racetrack memory. If we switch the notes around, the data flows in the opposite direction. Using only sound alone it’s possible to move data in both directions.